This global survey starts from the belief that the significant transformations in women‘s lives need to be fully documented and interpreted. It illustrates the critical challenges faced by women in the 20th century using original data from countries in every world region. The case studies are written by teams of scholars, educators, and policy analysts in Canada, the United States, Colombia, Iceland, the United Kingdom, Croatia, Japan, Bangladesh, Thailand, South Africa, Sudan, and Kenya. The catalysts for change in female well-being are identified from trends from 1900 to 2000 in infant mortality, maternal mortality, literacy, life expectancy, education, work, income, family structure, and political power. Trends are analyzed in the light of the century‘s major events, legislative initiatives, social policies, and leadership, to illustrate the processes that enhance, sustain, or detract from the female condition. 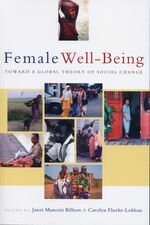 The last chapter suggests ideas for how to improve female well-being globally.